He may not have fully recognized it, but it is on the shoulders of the highly-popular Rey "Boom Boom" Bautista where the legitimacy of professioanal boxing truly rests. His fight against Thailand's Saichon Sotornpitak may only be a ten-round dukeout, a non-title affair, but the bout is expected to truly test the readiness of fans in Dubai to embrace boxing hopefully in the level of cricket and other European sports which dominate Dubai sporting skyline. Bautista versus Sotornpitak will headline the card dubbed "Philippines vs The Rest of the World, which is presented by KO Promotions in association with ALA Promotions to be aired "live" by ABS-CBN. "This is an even that has been in the offing for the last two years and a half," declared KO Promotions' Arniel Josua Armamento, one of the three main movers of the Dubai-based boxing outfit. Armamento flew in to join ALA's Michael Aldeguer during yesterday's press conference at the Cebu City Sports Club officially announcing the card, which will also boast of the inclusion of Bobby Pacquiao who will fight an Indonesian opponent. Pacquiao, however, has yet to get the go-signal from his superstar brother Manny Pacquiao, who many in Dubai hope will be at the fight venue to cheer for his brother. The event is to be staged at the 10,000-capacity Dubai Tennis Arena, venue of some of the biggest tennis matches held annually in the state. "We are counting on the support of some 400,000 Filipinos in Dubai, and the more than 650,000 Filipinos in the entire UAE," added Armamento, who is working with partners Ramon Pizarras and Zack Taumafai to produce a highly-entertaining event. 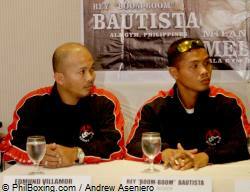 "Boom Boom Bautista automatically became the lead candidate to fight in Dubai when we were making plans for all these. Add to that the fact that my partner Ramon Pizarras is from Bohol," revealed the 38-yea-old Armamento, who is into the real estate, publishing, entertainment and agri business. The last professional boxing event in Dubai took place on February 8, 2008 featuring Michael Moorer against Shelby Gross. Reports, however, indicate that the fight did not do as well as organizers had expected. In the co-feature, ALA fighter Milan Milendo will defend his WBC Intercontinental title against Colombia's Devis Perez. The rest of the card pits Jason Pagara against John Gicharu of Kenya while Toledo City's Larry "Bon Jovi" Canillas takes on Fred Sayuni of Tanzania. Two kickboxing bouts will serve as curtain-raisers to the professional bouts. Top photo: Rey 'Boom Boom' Bautista (R) and trainer Edmund Villamor during Tuesday's presscon at the City Sports Club in Cebu City. Photo by Andrew Aseniero.